Snacking is an awesome way to get a nutrition boost until the next meal or to just find some good ol’ comfort in a tasty dish. 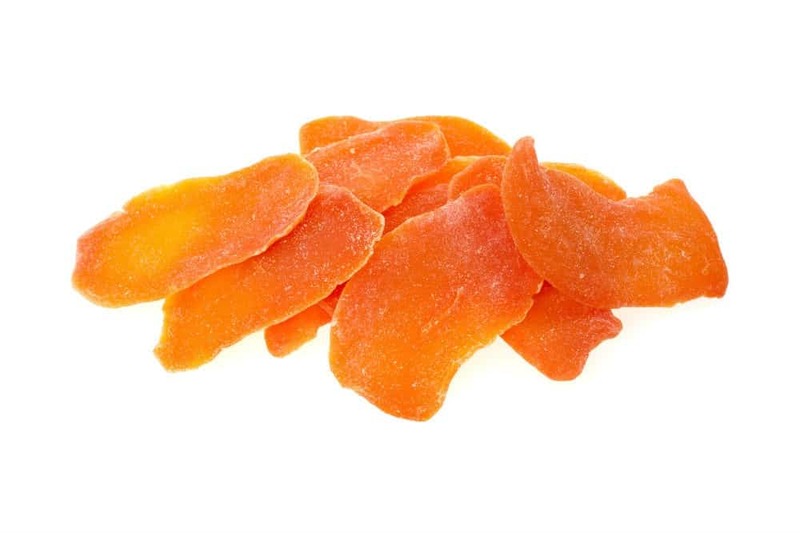 But snacks can add up and create an imbalance in one’s diet since they are packed with calories. 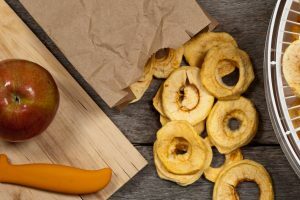 There are a lot of healthy snacks out there, mostly fruits and veggies, but these are often unsavory and don’t really meet the requirements of a tasty snack. 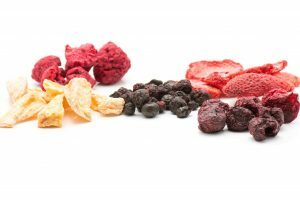 People often opt for pre-packaged dry food as a healthy alternative to traditional snacks like chips, and cheesy puffs, jerky, but these snacks can get expensive and are made using unwanted additives. For those who would like to take a more hands-on approach, and DIY their own snacks, a food dehydrator is the way to go. 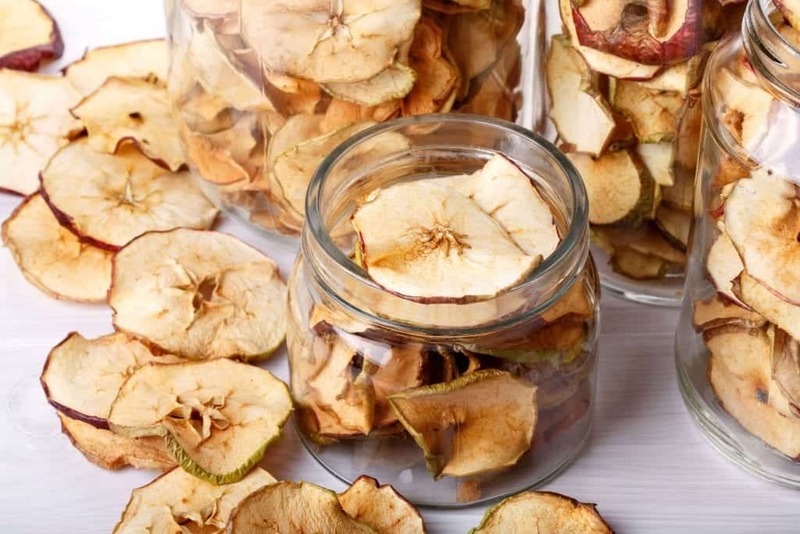 Food dehydrators have a lot of different applications, whether it’s to prep fruit and veggies for a dish, make some delicious snacks or just preserve some high-quality meat by making some organic jerky. 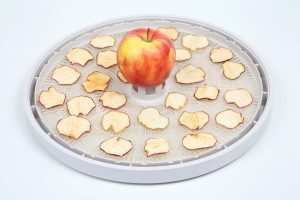 Depending on the “courage” that the user has, food dehydrators can be more versatile than one would think, being a wonderful choice for different applications. is a great product for those who are thinking about changing their diets a bit. This is, by no means, high-end product, so those who owned an industrial-level product in the past will find this one seriously lacking firepower. That being said, it works great for small families or singles that want to get a better grip on their eating habits. The design is pretty straightforward—five trays that are placed in a cylindrical plastic body. Below lies the heating and ventilation system. Because the trays are designed for optimal venting, the ventilation system will keep dryness at a minimum, keeping condensation and moisture from ruining the crunchiness of the products. The front panel features several buttons, used for operating and cycling through the device’s limited but useful functions. These buttons allow the user to control temperature and cycle length, meaning that they can set the device to run at 113 F degrees for 8 hours. To make it even easier, the whole top side is transparent, so the user can manually turn it off if they’ve been a bit generous with the cycle’s length. Overall, the build quality is average, but reliable. 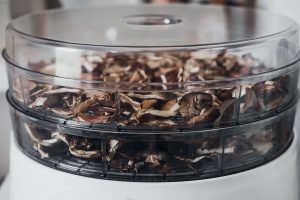 The white and black plastic might not be too impressive, but it allows the ValJax Food Dehydrator to easily-blend in a modern kitchen environment without drawing too much attention. Size-wise, it can find a comfortable place on the kitchen counter. By nature, it’s very easy to clean, since food doesn’t stick to anything at these temperatures. That being said, the fact that it features bottom-to-top air circulation will be a problem for some types of food. 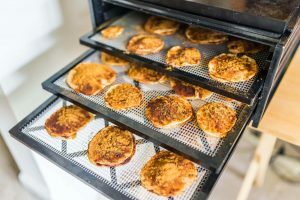 Because the ventilation system is placed at the bottom and the device relies on air circulating through the trays, users won’t be able to place baking sheets to support juicier foods. Here’s where things get better. While the features are basic, they work very well and are enough for users to cook their desired dishes as intended. Both the timer and the thermostat work like a clock. Using only the front panel, the user can set the desired temperature and time cycle, monitoring the progress through the transparent lid for further adjustments. The smell is usually very mild to nonexistent, with onion being one of the only foods actually to emit a noticeable odor. Even better, lingering odors aren’t a problem, as the device won’t reach high-enough temperature for the smell to settle in. It’s rated to work at 500 watts, that being the maximum amount of power that the device can draw from the outlet. It’s plenty of power for drying food, and the thermostat makes it really energy efficient. In the long run, it’s a great investment for those who constantly find themselves stacking up fruit chips and jerky in their supermarket shopping carts. Moreover, the ability to set a timer allows the user to go on about their day while the dish is being prepared, keeping electricity bills low and turning frowns into smiles. 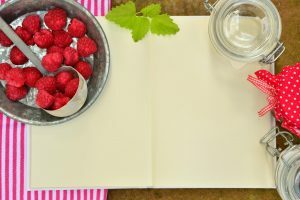 isn’t able to work with certain types of foods, like doughy pitas and anything that requires a baking sheet, it can store multiple types of food at once. The ventilation system favors multiple-food drying since tastes won’t blend because of the bottom-to-top air motion. 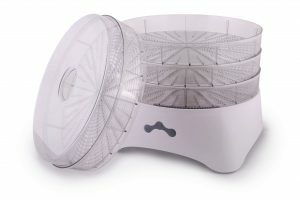 Turning milk into yogurt is also a great way of using the ValJax food dehydrator, as the shape and transparent nature of the body allow the user to store blows and keep an eye on the current texture of the dairy product. 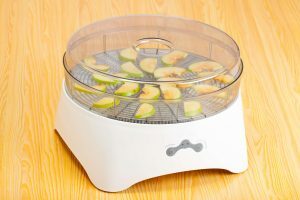 While this is a great entry-level dehydrator, the current increased interest for the vegan lifestyle has made the market a bit more competitive than a few years ago, so it’s important to keep an eye out for alternatives. 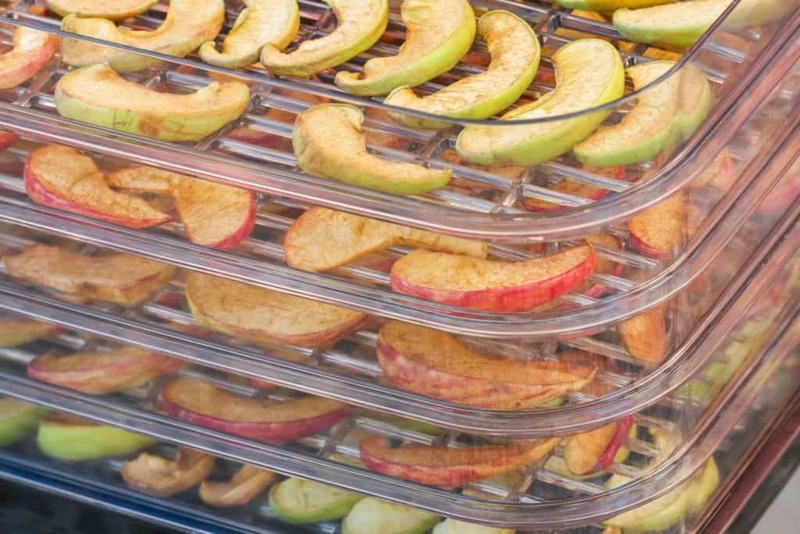 Taking a look at some of the other market choices, the L’EQUIP 528 6 Tray Food Dehydrator seems like a good alternative to the ValJax product, since it’s even bigger in size and has a more industrial-type design. But that’s only at first glance. In reality, the L’EQUIP is a considerably inferior dehydrator, mainly because of its unreliability and high rate of failure. The heating element, while functional, doesn’t properly communicate with the thermostat, this translating into random shutdowns. While these are not that common, the whole device is opaque, so the user can’t keep an eye on the current state of the food. Having a completely opaque design is a big flaw, since opening the trays to check the food can really affect the temperature of the products, translating into slower, more inconsistent results. 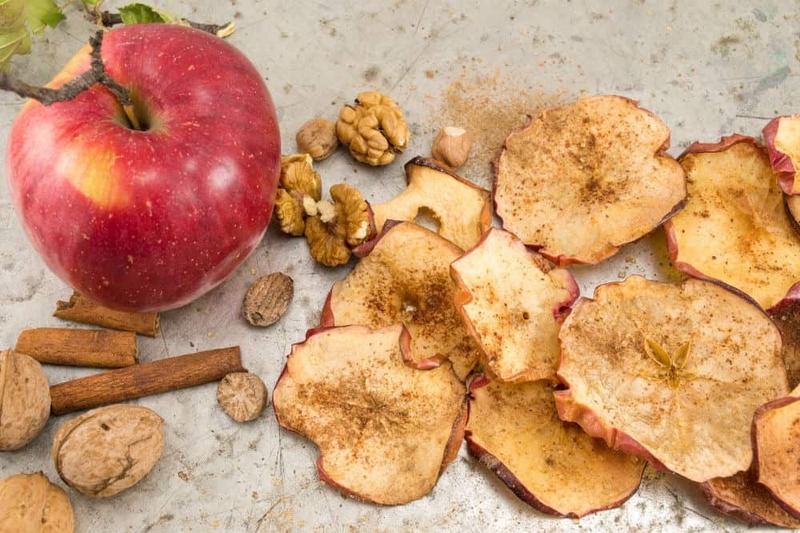 Because of this, the VelJax Food dehydrator is the better product of the two. All in all, the VelJax Food dehydrator is a reliable little device which provides small families and entry-level users with plenty of dehydrating power for making their favorite snacks. It features a simple design, is easy to use and will find a comfortable place in any kitchen. The materials used are not of the highest quality, but the design is on the spot, making it reliable. It’s guaranteed to work wonders for one’s diet.